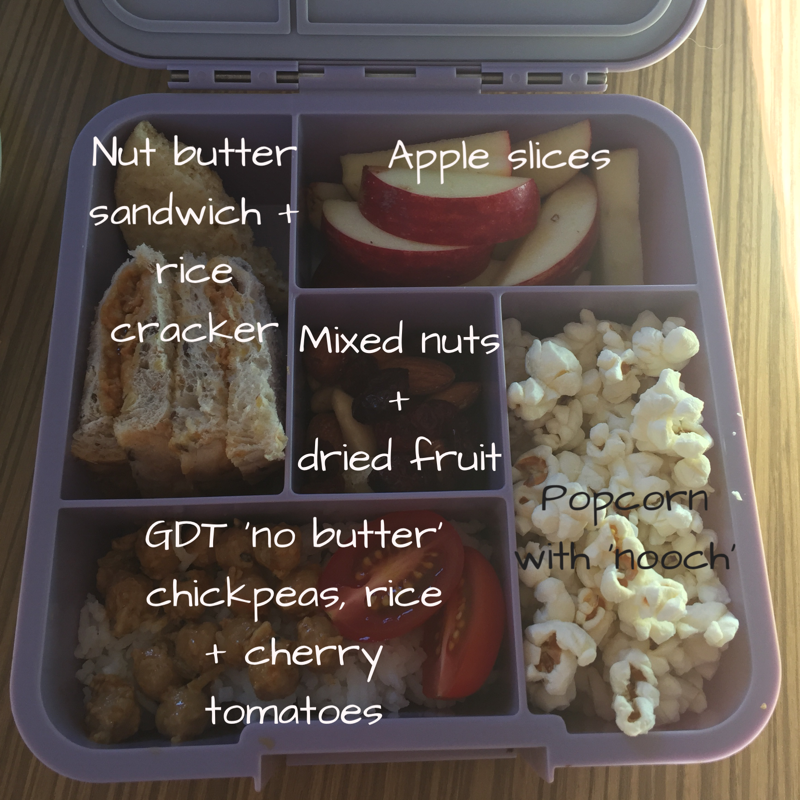 A new school term can be the perfect time to get into some new habits to ensure healthy school lunches for your little ones. 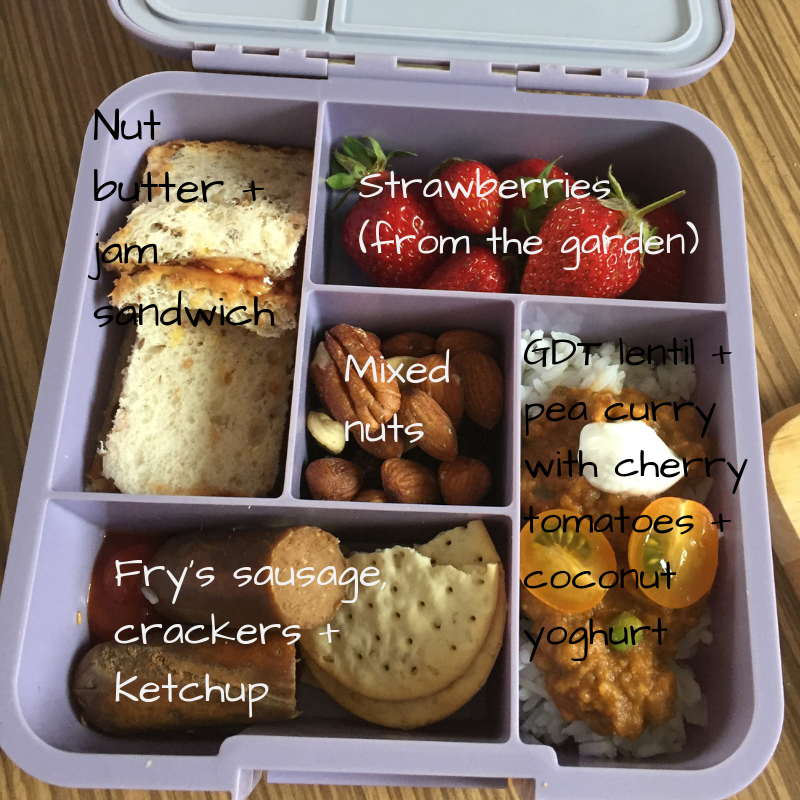 Tom's wife Jen is heading back to work next week, and their daughter into nursery, so we've asked her to take over our blog this month to talk about her formula for a winning school lunch. All my friends tell me that their children are picky eaters. Here’s a secret, they all are! Toddlers, like our Violet, can seem especially so. That’s because they want to be in control. 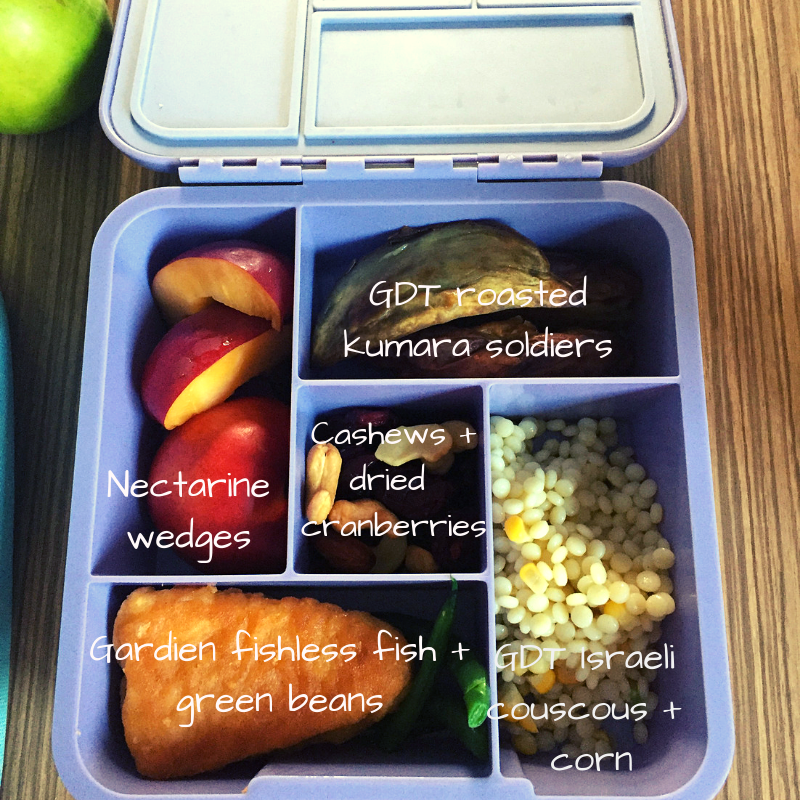 So how do you make an edible lunch for a fussy kid? The answer is choice. Tom’s Mum told me ages ago that her kids favourite dinners were ‘pick and choose’. Basically a smorgasbord or anything on hand. And, it makes perfect sense. Why settle for a Marmite sandwich when you can have a Marmite sandwich AND a veggie sausage? Fresh fruit – an absolute must, even if it’s a banana or mandarin. Violet loves to ‘do it herself’ so I usually just open the skin slightly so she can peel the rest at school. It’s a small thing but preparing the food the way they like it means it is more likely to make it into her tummy and not come back home with her at the end of the day. 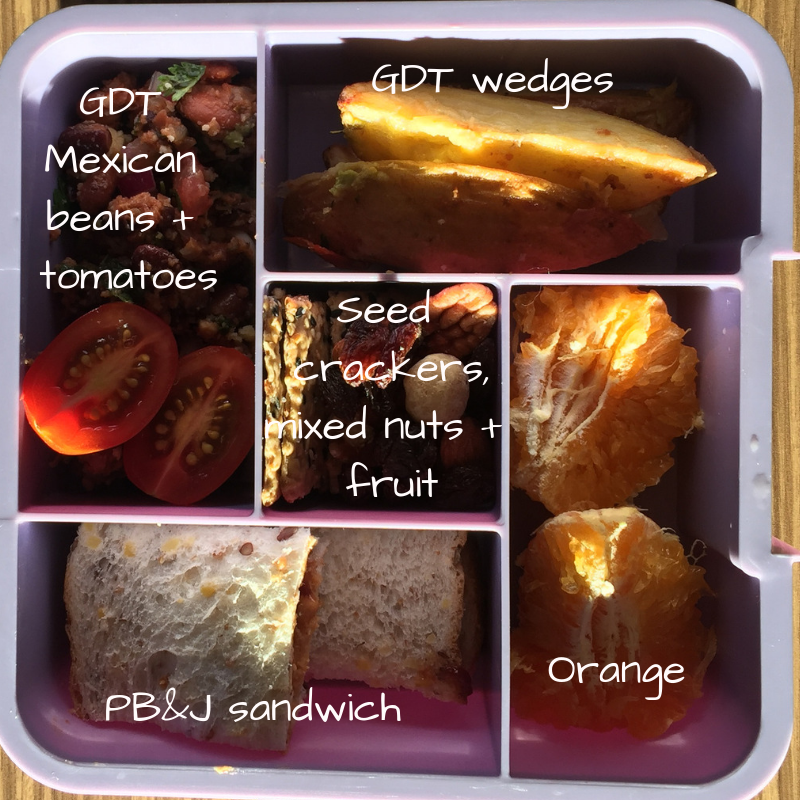 Green Dinner Table leftovers – if there is just a wee bit of rice or pasta, I save it and pop it in her lunch box the next day. She loves leftover beans from Mexican dishes or dal too. A little can go a long way! If there’s just rice, I sprinkle it with some seeds, add some nori and avocado to create de-constructed sushi. 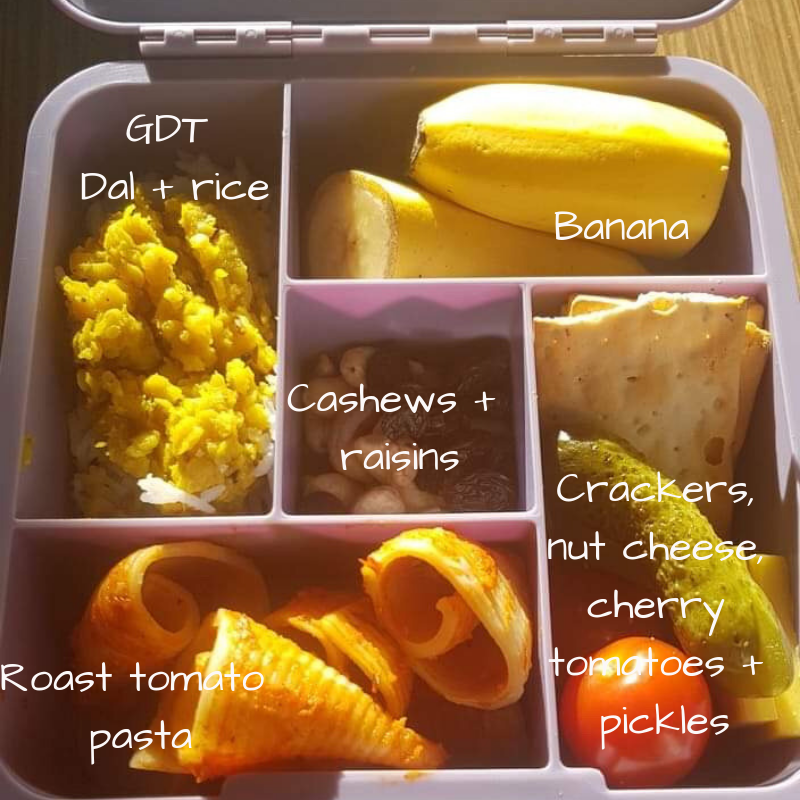 Sometimes this can fill two sections of her lunchbox! Nuts and dried fruit – we usually include raisins or other dried fruits and nuts, focusing on what’s liked but sometimes putting the odd hazelnut or almond, just to tempt her to try something new. Often, if she doesn’t know what it is, she’ll ask her teacher and they’ll talk about it. This can peek her curiosity. Savouries – sometimes we’ll add a veggie sausage or crackers and nut cheese along with a pickle or two and some cherry tomatoes. Tom and I still aren’t sure if she prefers them cut or not (maybe she doesn’t know herself!). Olives are another favourite. Sometime we even include popcorn sprinkled with nooch (nutritional yeast). Pick ingredients your kid already likes and run with it! Leftover baking – chocolate is a no-no according to school rules, but if we have some leftover baking, it will find it’s way into her lunchbox. Everyone deserves a treat once in a while, right? It now seems rather simple and easy, but when I started on this chapter in Violet’s life it seemed overwhelming. It the end, it’s a small thing that means a lot to her. Her lunchbox is the first thing she opens when she gets to nursery. She loves telling her friends about what she has in it. It also provides her a with a connection to home while she’s away from us and helps her feel settled and cared for, so she can have the best day possible.